If you are looking for Inspirational Gifts for Teens or Women, Boys or Men, look no further! 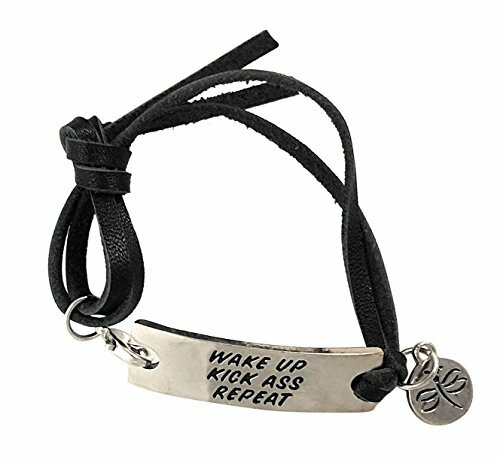 Words of wisdom engraved on silver plate that will inspire your heart, motivate your mind in leading your life, creating success, achieving your goals, and overcoming your fears. The Spirit of the Dragonfly on the tag reminds us that everything is possible. It is the keeper of our dreams, seeking out true potential and ability and reminding us to reconnect with our own strength, courage and happiness. The silver metal plate is 1.6" long x 0.4" wide x 2mm thick. The black leather cord is long enough to adjust to most adult wrist sizes and can easily be made to fit a young girl or boy. Adjusting our bracelets is simple. Use the body of the black leather cord and pull it to make it just the right size. Once you have established the right size, use the lobster claw clasp to detach it for easy on and off. COMBINING THE POWER OF WORDS WITH THE SPIRIT OF THE DRAGONFLY: Words of wisdom engraved on silver plate that will inspire your heart, motivate your mind in leading your life, creating success, achieving your goals, and overcoming your fears. The Spirit of the Dragonfly on the tag reminds us that everything is possible. It is the keeper of our dreams, seeking out true potential and ability and reminding us to reconnect with our own strength, courage and happiness. MEASUREMENTS: The silver metal plate is 1.6" long x 0.4" wide x 2mm thick. The black leather cord is long enough to adjust to most adult wrist sizes and can easily be made to fit a young girl or boy. ADJUSTING OUR BRACELETS IS SIMPLE: Use the body of the black leather cord and pull it to make it just the right size. The "tails" of the cord are fixed and do not move. Once you have established the right size, use the lobster claw clasp to detach it for easy on and off. GIFT PACKAGING AND OUR GUARANTEE: You will receive gift packaging with every bracelet. The purple organza drawstring sack will also contain an insert about the symbolic dragonfly so that the recipient can be reminded to bring more lightness and joy into his or her life. 100% Customer Satisfaction is our highest priority. To that end we stand behind our products and will cheerfully refund or replace any of our bracelets that does not perform as it should. If you have any questions about this product by Dragonfly Spirit Designs, contact us by completing and submitting the form below. If you are looking for a specif part number, please include it with your message.